The extra opt-in security feature has successfully passed trials and is now live for all 1 billion users of the service. 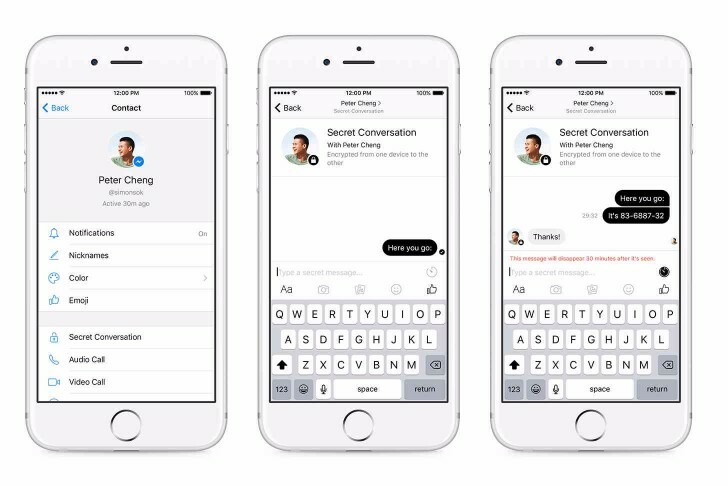 A few months ago Facebook started testing its very own end-to-end encryption in Messenger and starting today the feature is available to all users. Just like WhatsApp, another IM company that already offers the feature, Messenger uses the Signal Protocol developed by Open Whisper Systems. To get an end-to-end encrypted chat with someone, you'll need to start what is called a Secret Conversation with that person. The option can be accessed by pressing the person's name in any regular conversation. Naturally, the Secret Conversation is absolutely separate from any other communication between the two parties. Furthermore, it can only be accessed from a single device and won't be synced across your clients. Facebook says this is necessary to safeguard the cryptographic security of the messages it claims even it can't access or monitor. Within a Secret Conversation you won't be able to exchange GIFs and videos. However, sharing pictures still works and so do stickers. As an added bonus, you can also set a self-destruct timer on your messages, ala Snapchat, ranging from five seconds to a day. As already mentioned, the feature is now live for all Messenger users, but is still opt-in and requires the latest version of the app. That being said, the majority of users will likely go on using the regular unprotected communication channel. But, knowing you have the option for some extra bit of security, or at least the sense of one is always welcome. I like that privacy is an opt in, while unsolicited advertising,spam and anything that undermines privacy is opt out.